I kept posting updates in the wrong section, so thought I'd make a thread. Anyway I decided to make more time and try and get this thing running. I removed the original EPROM, tested it, and replaced it with a copy of the Lansoft Diagnostics ROM. This ROM requires no RAM and very few working features - so it can be used to fire up machines that would normally be just 'dead'. 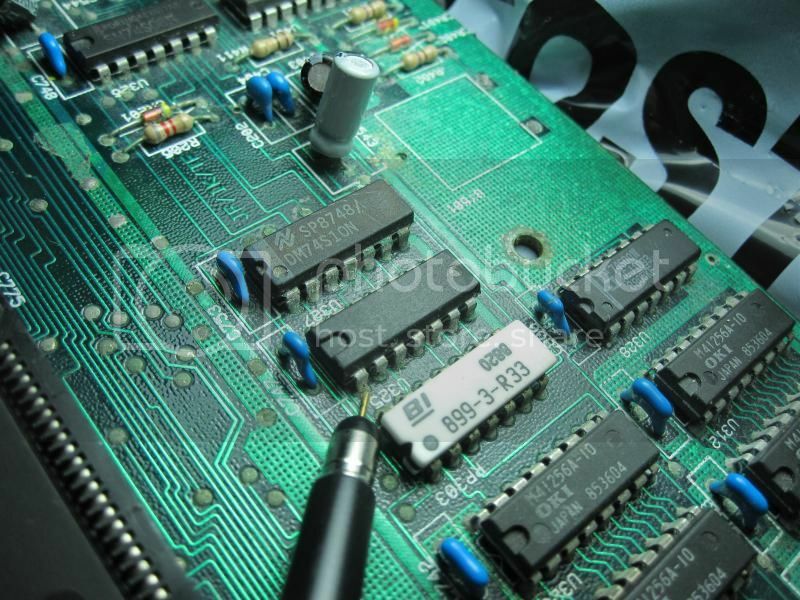 8253 Channel 1 is used to refresh the memory, so with that broken I only get 1 out of 8 bits passing the test. It's dinner time, but I'll be back to investigate what is going on with that timer channel. It doesn't have any 8253, it has a Farady all-one-special the FE-2010A. I've tried reseating it, putting pressure on it, checking the joins - but timer 1 still fails and I only seem to have one working RAM chip (unlikely to be accurate, since no timer 1 = no DRAM refresh). I've ordered a "NOS" replacement from China, see if that does anything (3-4 weeks away). If anyone has some thoughts or possibilities I'd be keen to hear them. I'm back just in time then? Awesome I'll give him a try! Power supply is running like a charm now, FE2010A is on it's way from China but I can't be sure if it's one of the logic chips, caps near the RAM, or the FE2010A - so a replacement board could be quite good. I did hook up a very poor quality oscilliscope - and that did show that the logic chips that go between the FE2010A and memory were switching - but the quality didn't let me see how solid a signal it was - just that it was moving about. I was hoping to find one of the chips with it's gates stuck on or similar. I got a better oscilliscope - it was made in 1986 but it's dual channel 10Mhz - thanks trash palace (best $1 I ever spent). Anyway I've been poking around it today. 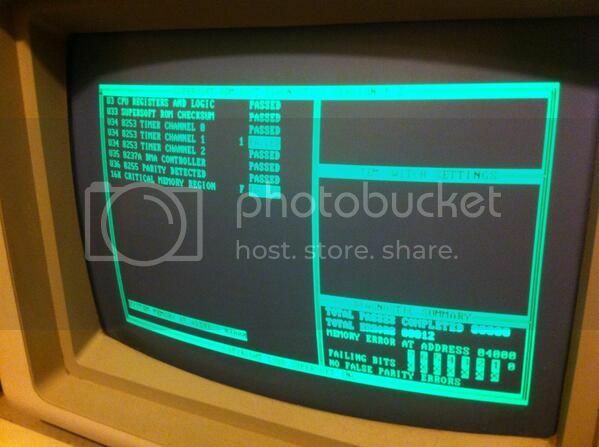 I think the Timer 1 just fails because the Commodore doesn't allow you to use it in a general sense. I looked at RAS (fired by Timer 1) on the scope and it was showing barely anything, so following the diagram the next chip in line (going backwards) was a 74S04 hex inverter. So I checked the inputs and outputs. The inputs are nice big square waves that jump from around 5V down to 0V, the outputs jump from 0.5V to GND :/ I'm thinking that the 74S08 is stuffed. Measurements were taken from the chips actual pins on top - so I know it's not a bad solder joint. Grabbing a replacement tomorrow, hopefully that solves the issue. Ugh, I hate working on old boards with tiny pads that likely used lead-free solder which has aged and argh. In the future I'll be more careful, but it's so awkward, by the time you get the solder off you've lifted the pad. So anyway the new 74LS04 worked a treat, I've got a proper RAS signal on my RAM chips now and 9 times out of 10 I even pass my Base 16KB test! But I caused a wee bit of damage to the PCB (one tiny trace has gone + a bit of a mess) - and I'm not sure if the current memory errors are related to that (~50% chance) or it's something else again. With the circuit diagrams at hand, I should be able to repair the damaged trace correctly. I forgot to take a picture of correct RAS, but this is what the inverse of RAS looks like (so picture it upside down I guess - +5V dropping to GND for a tiny bit). RAS is used to select the row (CAS for column) but it's also used as a strobe to keep refreshing the memory. It's active low - so you should see +5V with tiny tips down, mine was just at +0V the entire time so the RAM didn't really have any chance at remembering anything. So yeah, now I need to replace that trace I damaged, and see what happens and take it from there. SpidersWeb wrote: Ugh, I hate working on old boards with tiny pads that likely used lead-free solder which has aged and argh. In the future I'll be more careful, but it's so awkward, by the time you get the solder off you've lifted the pad. I hear you, it's happened to me. Good to read these entries of your repair adventures Jono. I've also had the ITT Xtra out again - but tracking down it's bad chip(s) might take a while - no schematics and the traces are all over the place. 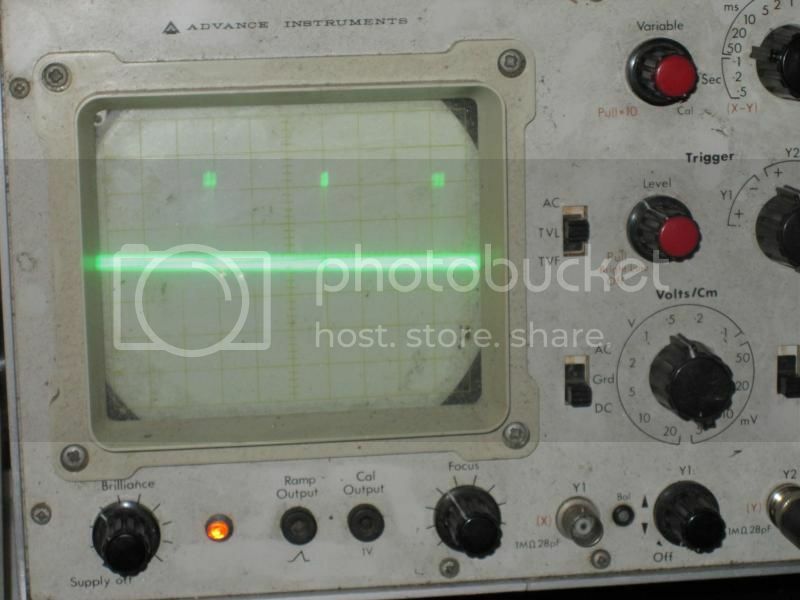 I can't help you with your diagnostics, but I just thought I'd chime in and compliment you on your $1 oscilloscope. Nice find, I LOVE old scopes like that! Great to see it still in useful service. Yeah it was outside at TP - plug cut off, jammed under a desk, lid loose etc I couldn't believe it when I got a trace! The owners manual with schematics etc took me 5 minutes to find online which was nice - apparently a 1986 model. I've actually been avoiding cleaning it because it's part of "the charm" but internally it's spotless. Only faults is the CRT seems to be on an angle, (you can see in the picture there is a slope on the trace), and Channel 1 doesn't auto-center when I change voltage divisions. But all the good stuff works a treat. Cal output still gives a perfect square wave, 1V peak to peak.